I do apologise to those Sepia Saturday followers in the Southern hemisphere for the parochial quotation, I know from their point of view "Sumer is agoeth out". 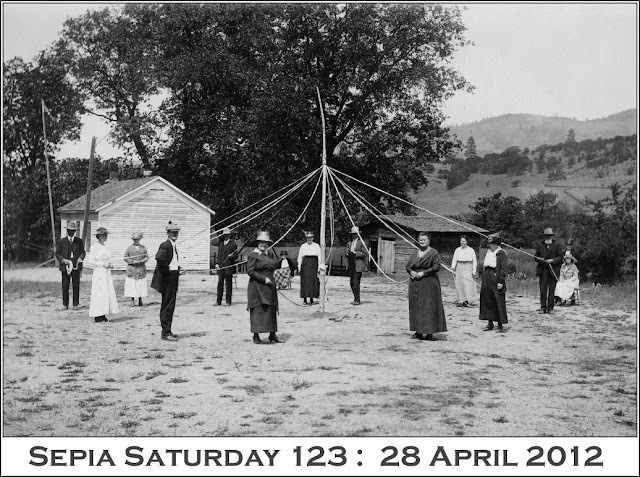 Whether summer is coming or going, the month of May is almost upon us and I have a folksy archive image for you this week, which is appropriately described in the catalogue of the Oregon State University Digital Archives as "May Day With People Around The May Pole". The picture, which dates back to 1920, was taken in the Neil Creek Farm Bureau Community, which, I assume, is in Oregon. As far as the "themers" are concerned, it is yours to make of what you will - you can really let your imaginations go on this one. And if you don't want to play themes, it doesn't matter - just share an old image and some new thoughts. In either case, post your post on or around Saturday 28 April, link it to the list below and then try and visit as many of the other participants as possible. In line with our new policy, here is a sneak preview of our next two archive images. For those who prefer an element of surprise, close your eyes now! Such exciting things are for the future. For now, let us concentrate on the carefully co-ordinated rustic dance that is Sepia Saturday. - Most people preferred the idea of an interpretive theme rather than a definitive one (i.e. a picture rather than a word). This was the way we did things until fairly recently and I am going to return to this approach. - Everyone supported the idea of being able to go off theme at any time - Sepia Saturday will always be a place to post old pictures rather than a "Theme Sunday"
- Most people seem to prefer the ability to see what the weekly image will be a few weeks in advance so that they have plenty of time to plan their interpretations. 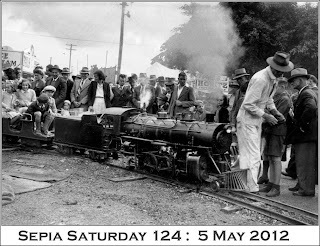 So our theme for Sepia Saturday 122 - post your posts on or around Saturday 21st April 2012 - is ..... well, it is whatever way you care to interpret the above archive image. 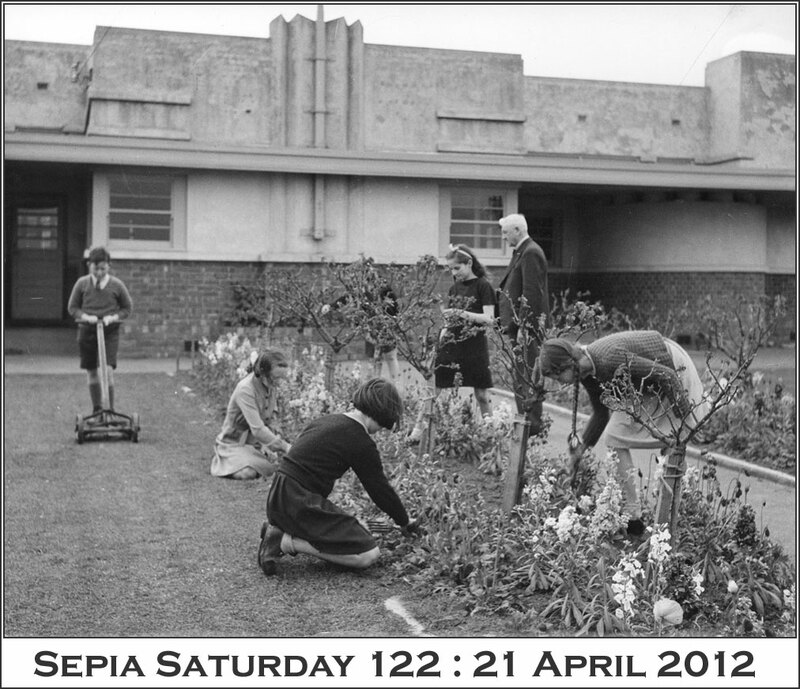 The photograph is entitled "Students at Drouin State School, Victoria Tend The School's Garden" and comes from the National Library of Australia stream on Flickr Commons. It was taken by Jim Fitzpatrick at some point during World War II and, in a wonderful insight into the times, the description notes that boys dig and grow vegetables whilst girls tend the flowers! You can go whichever way you want with interpreting this theme. Be your usual creative selves and cultivate a fine crop of posts. 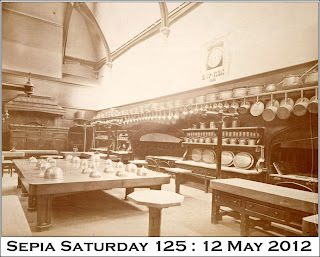 And for those who like to plan ahead, here are the next two "theme images" - for Sepia Saturday 123 and 124. If you would like to examine them in more detail you can click to enlarge. If you are taking part in Sepia Saturday 122 simply add a link to your post by using the Linky List below. We are taking to the air this week in Sepia Saturday as we celebrate FLIGHT. On one level this is a celebration of the 100th anniversary of the Royal Flying Corps (suggested by Sepia Saturday contributor, Little Nell), but on another level it can be any type of flight : the flight of machines, the flight of birds and insects or simply the flight of fancy. 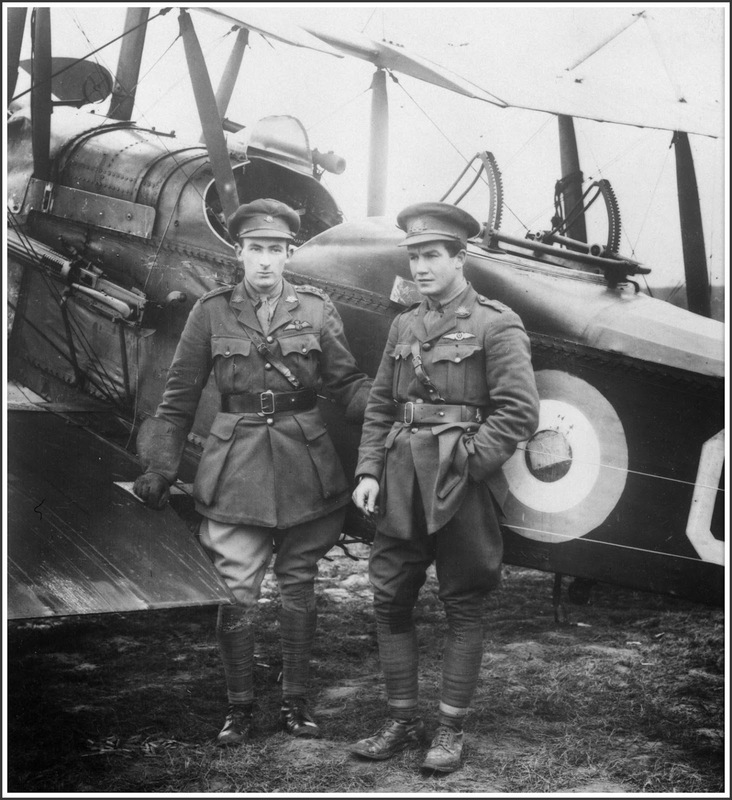 My image is not of the Royal Flying Corps but the Australian Flying Corps and it features Captain Charles C Matheson (left) and Lieutenant C R Fenwicke, both of No. 3 Squadron, Australian Flying Corps (AFC) beside their RE8 aircraft (picture from the Australian War Memorial Collection via Flickr Commons). Whatever type of flight you take, please be at the Departure Gate on or around Saturday 14th April 2012. All that remains is for me to wish you all a good flight aboard Sepia Saturday 121, your nearest emergency exit is being pointed out by the cabin crew now. Now I know what you are going to say. 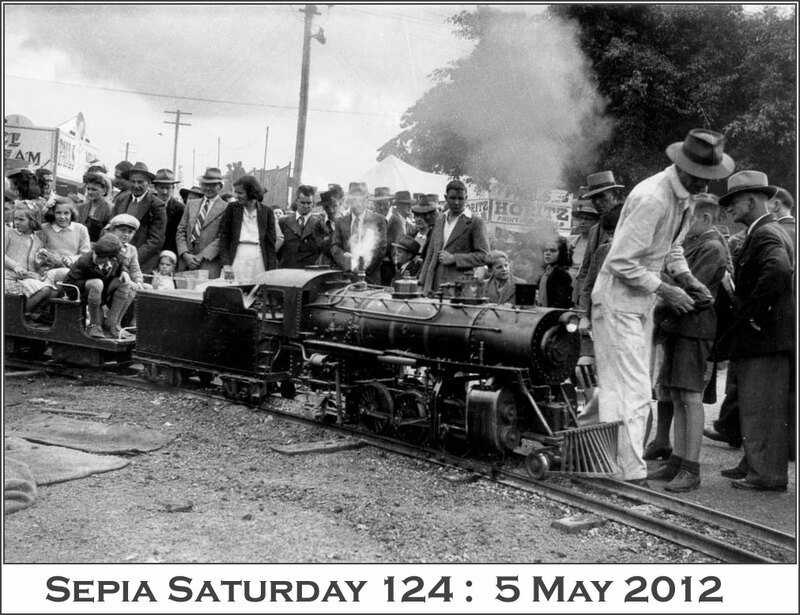 You are going to say, "hang on a minute, I am sure when I checked the Sepia Saturday call earlier today it said SLEEP". Well all I can say is that you must have fallen asleep and dreamt it. Of course it isn't sleep, because we have had that before as a theme. It is actually LIBRARY because it is National Library Week between the 8th and 14th April. 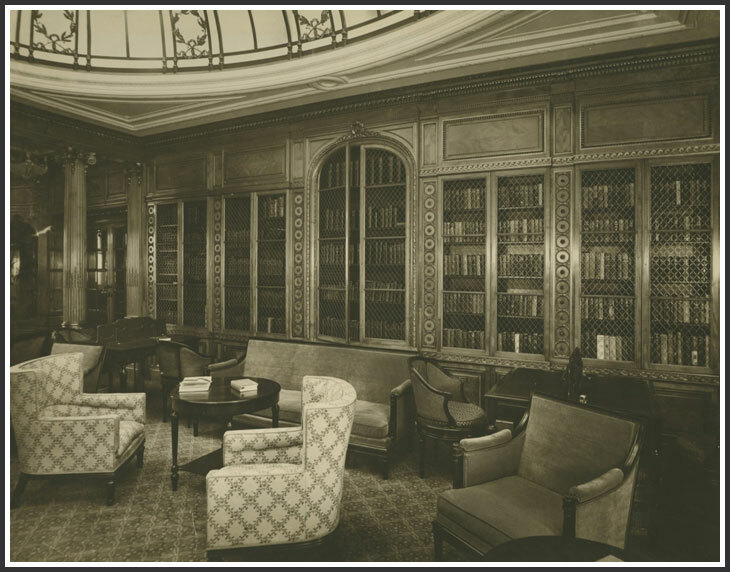 And to prove it, here is a picture of the library on board the ill-fated liner the Mauretania (courtesy of Tyne and Wear Archives via the one and only Flickr Commons). It might be a bit of a challenge, but remember, you can interpret the theme in any way you want, or you can ignore the theme altogether. You can even post a picture to match the theme SLEEP if you want. Whatever the subject of your old image, post your post on or around Saturday 7th April and link to the list below. And talking of lists, I really need a list of past themes before I make a silly mistake. The "flight" theme (SS121) comes from a suggestion from Marilyn Brindley (Little Nell) that we might want to mark the centenary of the formation of the Royal Flying Corps which falls on the 13th April. SS122 (gardens) is a bit of a commemoration as well as it will coincide with National Garden Day in Andorra (yes, I have made that up in order to cover yet another error in the archives). 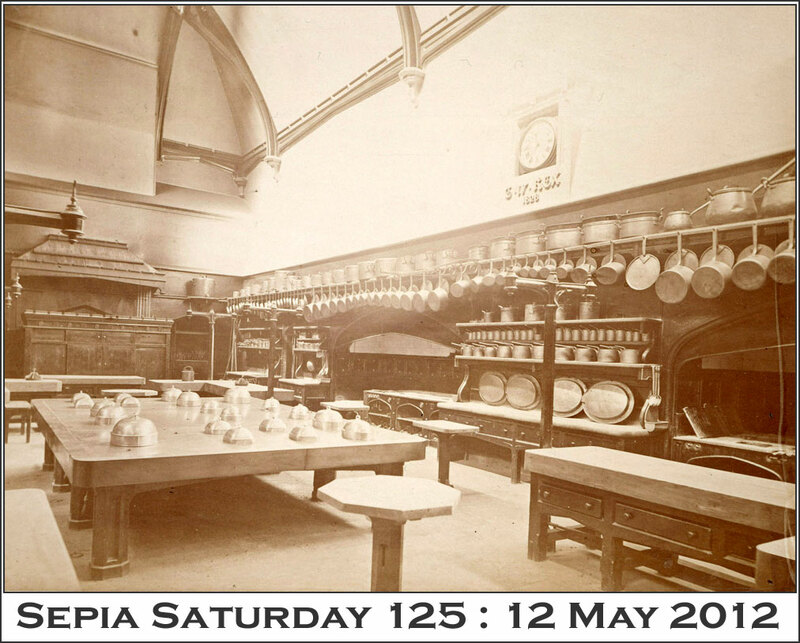 If anyone has any suggestions for future anniversaries we might want to mark with a Sepia Saturday theme please let me know - with as much advanced warning as possible - and I will try and incorporate them into our rolling programme. SITUATIONS VACANT : Wanted, Sepia Saturday Archivist and List Keeper. Pay, non-existent. Prospects, limited by imagination alone.